The Life Word: Now Blogging: Gleanings from 1894 Sword and Trowel. Now Blogging: Gleanings from 1894 Sword and Trowel. Yesterday I received in the post a hard-bound copy of the 1894 edition of the Sword and Trowel, the magazine launched and edited by C.H. Spurgeon. As I read through its pages, I will publish various parts I think are worth repeating. 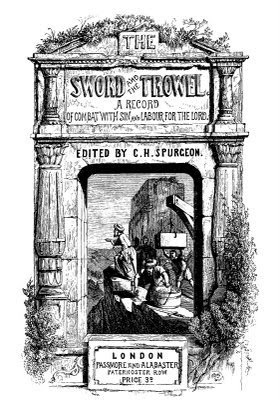 The 1894 edition of the Sword and Trowel comes a mere two years after the Lord called C.H. Spurgeon to his heavenly home. With the loss of that great preacher, pastor and Christian leader, several of his family and friends shared together their grief and reflected back on the influence Spurgeon had on their lives. Thus, the 1894 edition of the Sword and Trowl seems more Spurgeon saturated than earlier issues of the magazine published when Spurgeon was living. I trust you'll return frequently to read the many profitable items I glean from the 1894 edition of the Sword and Trowel. No, I don't, but would love to read a copy. Sounds like quite a treasure!